Jehovah's Witnesses are a religious group with more than eight million members throughout the world. They believe God will end the present system of things, which belongs to Satan, with its crime, violence, sickness and death; they believe it will be replaced with his Kingdom which will restore his original purpose for the Earth, bringing about peace for all humans who live by the Bible's standards. Most of the religion's beliefs are based on the Bible. These beliefs were taught by Charles Taze Russell, a preacher who started a Bible study group in Pennsylvania in 1876, and later started publishing a religious magazine called The Watchtower. Many of those beliefs, especially about who God is and what his plans are for humans and the earth, are different to what is taught in mainstream Christian churches. Jehovah's Witnesses believe that only 144,000 people will go to heaven and that the remaining people who obey God will live forever on a paradise Earth. They do not believe that God is a Trinity. They teach that when people die, they remain in their graves until Jesus Christ resurrects them after God's Kingdom, or government, is ruling over earth. Witnesses are best known for preaching their beliefs from door-to-door and in other public places, and offering their magazines, The Watchtower and Awake! They are also well known for refusing to join armies and refusing blood transfusions. In 1870 a young clothing shop owner named Charles Taze Russell heard an Adventist preacher speak. The preacher said the Bible contained clues that showed God was about to set up a kingdom, or government, over earth. He said the kingdom, which is mentioned many times in the New Testament of the Bible, would be based in heaven, and it would completely change the way of life for everyone in the world. Russell studied that preacher's teachings, then arrived with a set of beliefs after looking through the Bible for answers. Using a combination of Bible verses and historical dates, Russell decided that God would very soon call to heaven a group of "saints" who would become the kings of that Kingdom. There would also be other "saints", who were faithful Christians of the past who had since died, who would also make up a total of 144,000 kings in heaven. Churches at the time were teaching that humans were still waiting for Jesus to return to earth in his Second Coming, but Russell believed all those Bible clues proved Jesus had actually returned in 1874 for what he called his parousia, or "presence". Russell believed part of God's plan was also to start Armageddon. Russell thought this Armageddon be a complete breakdown of law and order on earth, when governments and classes of people would fight among themselves. But after that, he believed, God would end sickness and death and allow humble and obedient Christians to live forever in perfect health. Russell believed it was very important that all Christians, including those who were attending churches, should learn those "truths." He believed these "truths" had been carefully hidden in the Bible for thousands of years. He therefore established a publishing group called the Watch Tower Bible and Tract Society of Pennsylvania. He wrote several books, set up some Bible study classes where people could study his teachings, and began publishing a magazine, Zion's Watch Tower and Herald of Christ's Presence, which announced that Christ was already present. He wrote about his belief that God would bring about all those events by 1914. By the time Russell died in 1916, the articles, books, pamphlets and sermons he had written totaled 50,000 printed pages, with almost 20 million copies of his books printed and distributed around the world. Joseph Franklin Rutherford, one of his followers, took Russell's position as president of the Watch Tower Society. Rutherford began writing and publishing many books as well. He made some changes to Russell's teachings and also required all the study groups, or congregations, around the world to agree to a united set of teachings and rules issued by the Watch Tower Society in New York. He told all members of the religion that they should start to go door to door preaching about God's Kingdom and also sell Watch Tower Society publications so more people would hear the message. In 1931 Rutherford introduced the name "Jehovah's Witnesses" for the religion, partly to highlight what the religion believed was God's holy name. By the time Rutherford died in 1942, the religion had a worldwide membership of 115,000. Nathan Knorr was appointed as third president of the Watch Tower Bible and Tract Society in 1942. Knorr commissioned a new translation of the Bible, the New World Translation of the Holy Scriptures, the full version of which was released in 1961. He organized large international assemblies, instituted new training programs for members, and expanded missionary activity and branch offices throughout the world. Knorr's presidency was also marked by an increasing use of explicit instructions guiding Witnesses in their lifestyle and conduct, and a greater use of congregational judicial procedures to enforce a strict moral code. Some of the new teachings, however, resulted in suffering for many Jehovah's Witnesses. Thousands were sent to prison or beaten or killed in several countries during World War II because they refused to fight. Later, in the United States, many children were expelled from schools because they refused to salute the flag, because they thought that God would not approve. Some countries still have laws against members practicing that religion. But Jehovah's Witnesses continued to grow rapidly, partly because they were becoming more skilled at teaching the public in their door-to-door preaching, and by 1977 they had more than two million members around the world and many properties at their New York headquarters. From 1966, the religion encouraged members to believe that God would bring Armageddon in 1975, and that the Kingdom would be set up very soon after. Some Witnesses sold businesses and homes, gave up jobs, delayed medical operations and decided against starting a family because they expected Armageddon to arrive. The religion's leaders later apologised for those statements, which they said were made because they were so keen for the Kingdom to come. Many members left at the time, because they were disappointed nothing had happened, but membership later climbed even higher. Jehovah's Witnesses are best known for their door-to-door ministry work. They believe Jesus Christ ordered them at Matthew 28:19 to "go make disciples of all the nations" warning people that the day of God's judgement, or Armageddon, will happen soon. All Witnesses are encouraged to spend time regularly in public preaching work, which usually involves offering The Watchtower or other Watch Tower Society publications. Since the Internet, Jehovah's Witnesses also preach online with some bible studies taking place over communication networks such as Skype. They teach people Witness doctrine about Jehovah and his plans for the earth. The buildings where Jehovah's Witnesses meet to worship are called Kingdom Halls. Unlike many other churches, these halls do not have altars, statues, symbols such as the Cross, or candles. Each congregation has two meetings a week, which members can also attend by phone, by listening in via a call-in number. They also attend big conventions and assemblies several times a year (some of them at hired sports arenas), where often thousands of Jehovah's Witnesses gather. Most meetings consist of talks or study sessions based on articles in Watchtower Society books and magazines about the Bible or Christian life. 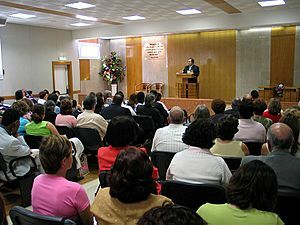 At the congregation, people in the audience, including children, are often invited to make comments and respond to questions asked by the speaker. The religion has elders and ministerial servants (who are called bishops and deacons in some other Christian churches), but they have no paid clergy. Most elders support themselves by having other jobs. Also, they do not consider themselves to be superior to other members of the congregation, and do not set themselves apart in any way (like by dressing in a certain way). They also refuse to have blood transfusions. They believe that in the Bible, God said blood should not be taken into the body. They are warned not to make close friends with people who are not Jehovah's Witnesses, because of the danger that those people could make their faith in God weaker. However, they are allowed to be around non-Witnesses..
Jehovah's Witnesses Facts for Kids. Kiddle Encyclopedia.